This set continues my ‘Australian Dream’ mini series – think of it as a small exhibition in instalments, or a little series of observations on the Australian psyche from an outsider’s point of view – well, not a total outsider because I did live there during my childhood. Today we add the protagonists. To quote Shakespeare: “All the world’s a stage, and all the men and women merely players”. I think there’s very little question that this series of images calls for the cinematic treatment to fully convey the mood, and add that little bit of perceived orderliness I observed in person. 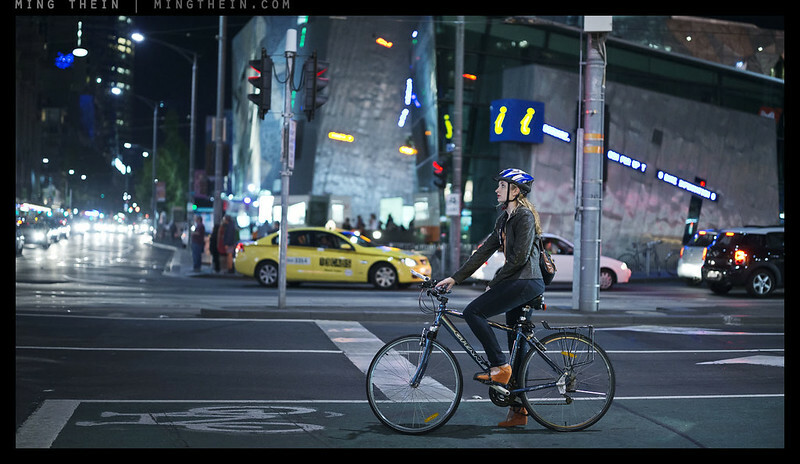 I’ve used a couple of wider aspect 2.4:1 images here; this isn’t something I usually do, but the longer/ wider scenes in Melbourne – probably a product of the grid street layout and the physical expansiveness of the place – lent itself to that kind of composition well. Note that 2.4:1 matches widescreen cinema. I probably wouldn’t attempt this with anything lower resolution than the D800E because you’d land up throwing away too many pixels to leave you with anything printable; even now we’re down to about 22MP, or about 60% of the original resolution. It’s interesting to see your take on somewhere I’m familiar with. For the ultimate in Australian “orderliness” you should visit Perth! It is limiting but I guess it makes living here sort of easy. Yes, and for that reason I rarely take photos around Perth – usually when I travel – but I suspect learning to be creative in familiar (boring?) environments is essential to improve in photography. Beautiful set of photos. Especially love the 2.4:1. Never have even thought of going so wide. Difficult to even get a 16:9 to look good. 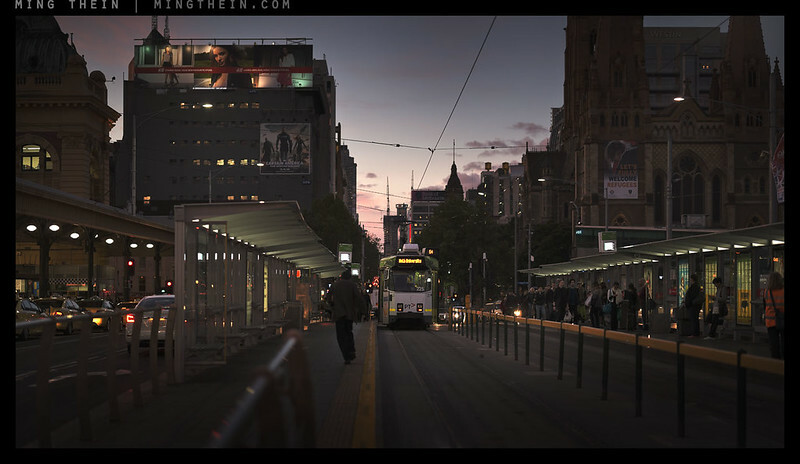 My favorite of the set: Last tram home. Somehow a view so typical yet so well done it captivates the eye. On another note, never been to Melbourne yet, but I was under the impression it would be the most European of the Australian cities, compared to say Sydney which is more of “new world” city akin to the U.S cities. Just goes to show how different reality and what one (I in this case ) believes can be. 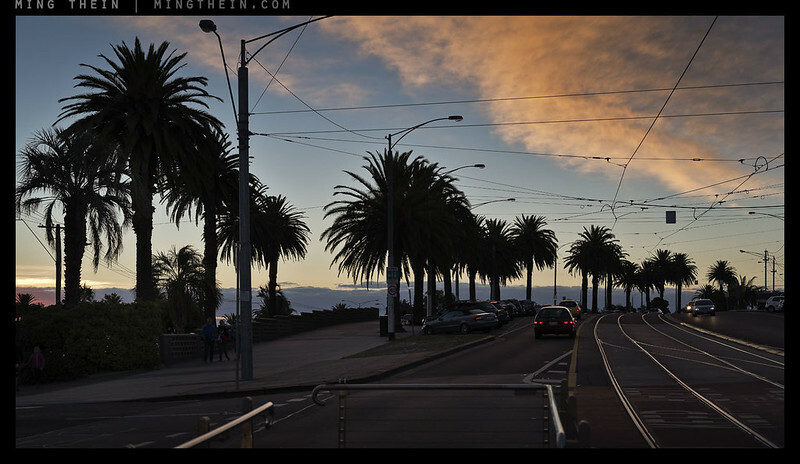 I need to visit Melbourne the next time I get a chance to go Down Under. Great IQ as usual. But the images don’t say “Australia” or “Aussies” or even “Oz” to me. They look pretty much like any other urban area here or there in a warm climate. Well, everybody sees the world differently. What does say ‘Australian’ to you then? Especially given that all urban areas are looking increasingly similar? As always a nice bunch of photos and some ideas I believe might work here in Houston. I have used 16:9 crops a lot, but just might try the 2.4:1 after seeing these. Starting with 36mp on my D800, I am not one bit worried about tossing some MP. I find it tough to find enough lateral context to fill a 2.4:1, but not so much that the sides dominate over the main subject. Like the look, just can’t always use it. No kidding, but it is something to try, another tool in the box. Ha! I work in retail/hospitality, and believe me, not everything closes at 5pm sharp. What does btw? 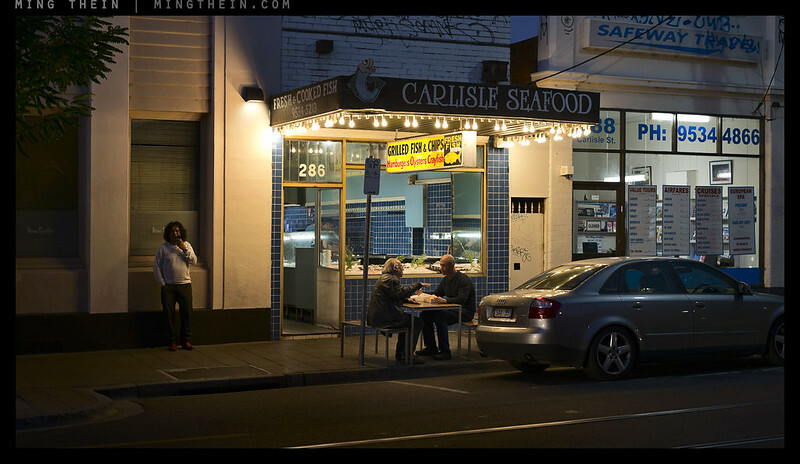 I’ve lived in this city for all my life, and this set of images truly resonates of my home town. Thank you Ming for capturing images that speak volumes of a metropolis that moves to the beat of so many different drums. Excellent couple of sets and the commentary goes very well with the images. 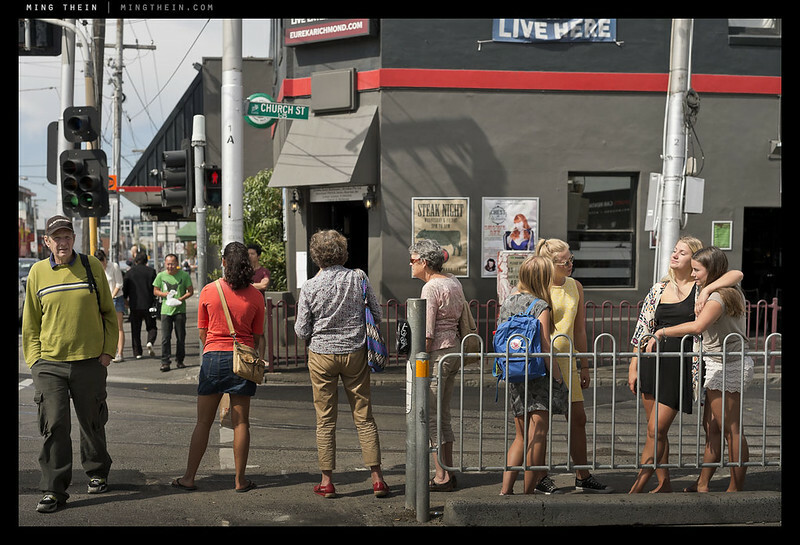 Never made it to Oz, but the whole orderliness is a bit unappealing – quite the opposite to the big Asian cities. I guess a good change of pace for yourself! Simply wonderful, thank you Ming for creating something so resfreshingly different. Very inspiring. You should more shooting people…would be probably demanding/challenging task for you…so people instead of watches;)…i know as a full pro you have to focus on sth. being an expert in one field at least and where you can still earn some money…. specialize not generalize in order to make a living…. Err…I do shoot a lot of corporate documentary work involving people also. In fact, I do more of that than I do watches these days. Anticipation is so great – love it! I grew up in New Zealand (3 years with regular visits until the age of 16) and I must say that, from my experiences in transit and a subsequent trip to Perth, I found Australia to be far too nannied. Coming from South Africa, I love the excitement that a little bit of chaos can bring – I find the rut of predictability and comfort can get a little suffocating. That being said, I think that, returning today, I would look at the the place in a completely new way. I will be returning to Auckland in December, perhaps I will take a detour on the way home and check out what Melbourne has to offer – I’ve heard it referred to as “the pulse of Australia”. Thanks for the wonderful series, as always! True, I suppose – everything has it’s trade-offs. I think you would really enjoy Cape Town! Cape Town is a great place for photography – while you still have your gear and life for that matter 😉 Definitely Cape Town is worth a visit. That’s what I keep getting told. Except it’s a 20+ hour journey…and I honestly don’t have the time. Two things come to mind… first, the night scenes are very well composed (they make me feel as though I could step through my computer screen and onto the street); second, your white balance is expertly done (in all digital photography I find WB to be the most difficult technical thing to CONSISTENTLY achieve). Well done! 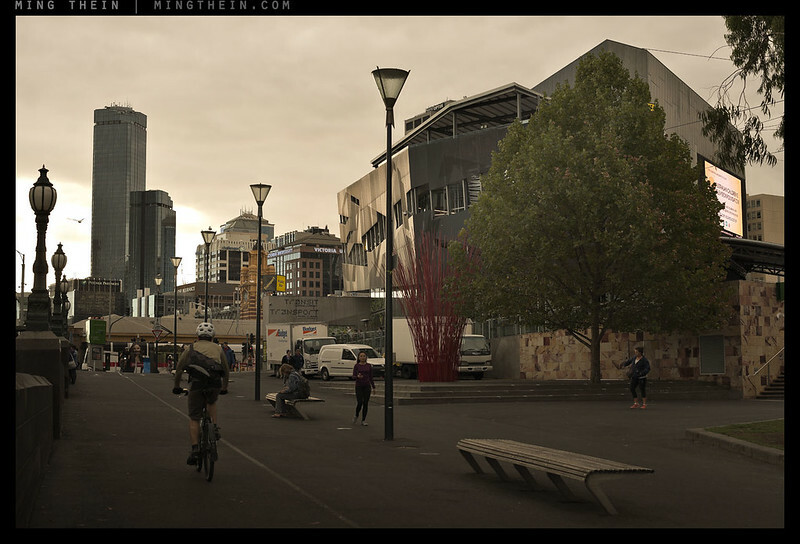 Love the ‘Ming style’ and great composition there Ming! Inspiring, as always! Perfect light on the last one.